How Can I Draw My Sword Upon Virginia? – Mark Loves History! Today in History, April 20: 1861 – “Mr. Blair, I look upon secession as anarchy. 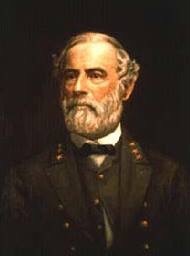 If I owned the four millions of slaves in the South I would sacrifice them all to the Union; but how can I draw my sword upon Virginia, my native state?” Robert E. Lee was the son of a Revolutionary War hero (Light Horse Harry Lee). He was a graduate of West Point, and would serve as superintendent of the USMA (West Point). He was a hero of the Mexican-American War, and was respected as the best officer, the best engineer, in the US Army. The Administration offered him the command of the defenses around Washington, but he turned it down, he could not raise his sword against his “country” of Virginia. On this date, Lee resigned his commission in the US Army and went home, after 32 years of service to the US Army. 3 days later he would accept a command in the Virginia militia, surprising even his family. Lee is such an enigma. He was a dedicated servant to his country, but served with the same dedication to the Confederacy. After the war, he acted as a gentleman in efforts to bring the nation back together. Whether we approve of his decisions or not, we can only see Robert E. Lee as an American.